Motorola, Inc. today introduced a new handheld reader, expanding its business-class portfolio of radio-frequency identification (RFID) reader solutions and complementing its existing industrial line of products. 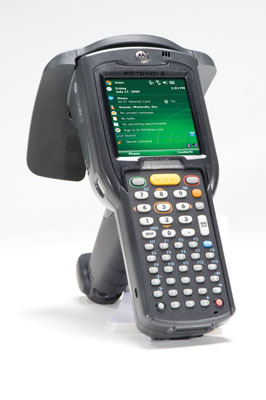 The Motorola MC3090-Z is the lightest high-performance handheld reader in its class – leveraging the ergonomic and rugged design of the category-leading MC3000 and incorporating the industry’s first dual-axis antenna for versatile use in retail, healthcare and business environments. The new MC3090-Z broadens Motorola’s portfolio of RFID solutions to allow enterprise customers to deploy the right products to get the job done. The MC3090-Z offers the best combination of form and function in the industry today – providing reliable performance throughout the enterprise. Supporting Gen 2 technology, this gun-style RFID reader also provides the ability to scan bar codes – reducing the number of devices organizations need to purchase and manage. In addition, the reader includes Motorola’s newly patented omni-directional antenna enabling orientation-insensitive data capture. This capability results in longer and wider read ranges for more accurate, rapid capture of tag data. The MC3090-Z’s orientation-insensitive RFID data capture makes it ideal for item-level applications such as retail cycle-counting, inventory and asset tracking. Until now, enterprises were forced to choose between two types of antennas: linear polarization for a longer read range or circular polarization for wider coverage. The MC3090-Z antenna combines the advantages of these two technologies into a patented dual-axis orientation-insensitive antenna. It offers a new level of read sensitivity for superior reliability and an expanded coverage area. In addition, by eliminating the need for alignment of the reader and tag, it increases user comfort and productivity. The new MC3090-Z handheld RFID reader, while designed for the carpeted space, is still quite rugged, passing some of the industry’s most stringent impact tests, with the ability to survive a four-foot drop to concrete. In addition, the reader can operate in a wide range of temperatures and is IP54 sealed to withstand dusty environments, spills and the routine wipe-downs required in healthcare and other challenging environments. Easy to install, configure and manage right out of the box, the MC3090-Z series is compatible with Microsoft Biz Talk Server 2006 R2 and supports applications written with Microsoft.NET 2.0-based APIs, allowing customers to host applications directly on the reader. The MC3090-Z offers security options supported by 802.11a, b and g. Users can choose to write password-protected applications for an additional level of security. To help customers maintain peak performance, Motorola Enterprise Mobility Services recommends Service from the Start with Comprehensive Coverage – a multi-year service providing inside-outside protection for the MC3090-Z. Customers can rest assured that no matter what is damaged – from broken displays, keypads, and internal and external components to select accessories – the repair is covered. Unexpected repair expenses are significantly reduced, providing service peace of mind from the date of the hardware purchase. And technical software support helps keep the MC3090-Z running at optimal efficiency – and customers connected to their critical business systems. The Motorola MC3090-Z handheld RFID reader will be available through Motorola channel partners and Motorola sales, and is expected to be available in North America in the first quarter of 2010 with a global rollout throughout the year.